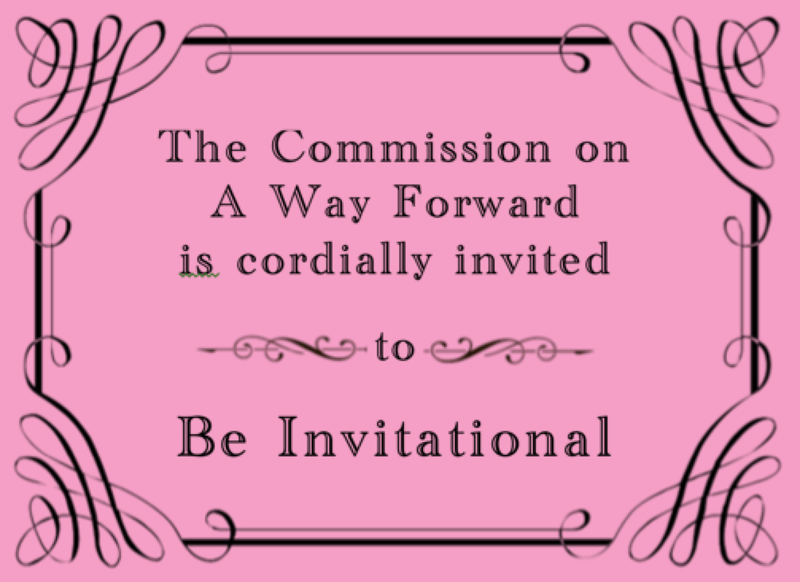 The Commission on a Way Forward was formed to heal an internal divide regarding human sexuality. The first 15 petitions were about moving on from being held back by a fifty-year-old understanding of sexuality that there is only heterosexuality and aberrations from it. Early on the bishops shifted from Human Sexuality to an emphasis upon “Unity.” Here we move into unity issues and find that they are really about pensions, not theologically grounded in relationships with G*D and Neighb*rs. If a local church or charge in the United States changes its relationship to The United Methodist Church through closure, abandonment, or release from the trust clause pursuant to ¶ 2548, ¶ 2549, or otherwise, notwithstanding whether property with title held by the local church is subject to the trust (under the terms of ¶ 2501), the local church shall contribute a withdrawal liability in an amount equal to its pro rata share of any aggregate unfunded pension obligations to the annual conference. The General Board of Pension and Health Benefits shall determine the aggregate funding obligations of the annual conference using market factors similar to a commercial annuity provider, from which the annual conference will determine the local church’s share. We now know the value of the “trust clause”—the market value of commercial annuities. This indicates we stay together for financial, not theological, reasons. This is our bottom-line. This is as close as we will get to selling our possessions and giving the proceeds to the poor (Mark 10:17–27). This petition is driven by the possibility of removing the “incompatibility” clause. Language about “or otherwise…” refers to churches removing themselves from the denomination in reaction to removal of official support for their desire to “not condone” marriage and ordination of LGBTQ+ persons. It is best for delegates to amend this petition with specific language limiting the time of this particular scheme of a “pro rata share” to some limited amount of years—perhaps 4 years. After a quadrennium, everyone would be expected to remain under the traditional trust clause. Leaving an open-ended process for a United Methodist congregation to leave invites other reasons for discontent to pop-up and to cause unnecessary periodic angst over one pet prejudice or another. This needs additional clarification. 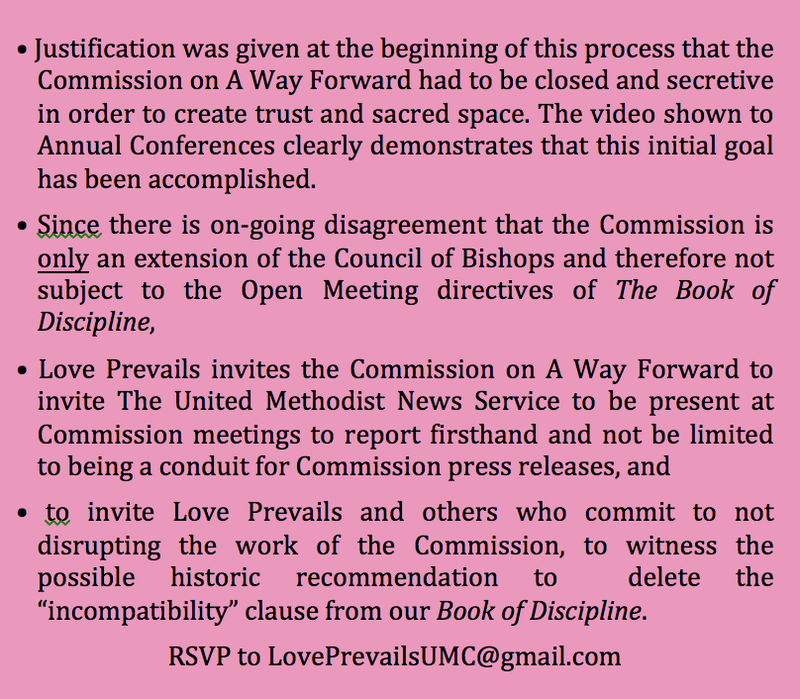 Love Prevails formally requests that the Council of Bishops write a pastoral letter to lesbian, gay, bisexual, transgender and queer members of the United Methodist Church in the United States and around the world. As the special General Conference approaches, our lives and worth come under ever more vicious and sustained scrutiny. No matter which plan is passed or if no plan is passed in February 2019, the lives and the loves of queer people will be fought over without us having much voice or vote in that process. Even if the One Church Plan is passed, we fear for the lives of queer people who must endure the pain of witnessing our church fight over our belovedness and belonging. As a majority of you supports this plan, it is necessary for you to both recognize and publicly state that in the option you have selected as the best way forward for the church, LGBTQ+ lives will continue to be actively debated, damaged, and harmed. For our spiritual, emotional, and physical safety, we request that you speak publicly with care and attention to the wounds of our people. We are not asking you to speak of “respecting both sides,” or of “everyone hurting,” or of “having a right to differing opinions.” We beseech you to speak directly to queer people whose spiritual and physical lives are in danger as we live in the crosshairs of church-sanctioned discrimination and violence. This request is difficult for us to make because we have experienced your lack of compassion for the hearts and souls of LGBTQ+ people. In the past, when speaking about “human sexuality,” your theological abstraction and emotional detachment has caused more injury than healing. Given the harm that you, the Council of Bishops, continues to perpetrate against queer people in the name of institutional unity, a pastoral letter directly to LGBTQ+ persons and our families is the very smallest act of care you could offer. As you craft this letter, we ask you to be mindful of the lived experience of queer people in the United Methodist Church. They have treated the wound of my people carelessly, saying, “Peace, peace,” when there is no peace.